Mental Prayer: A wonderful and vital way to get closer to God! Mental Prayer is a great way to get closer to our Lord! Prayer itself has been defined in part as lifting one’s heart and mind to God to adore Him, to thank Him for His benefits, to ask His forgiveness, and to beg of Him all the graces we need whether for soul or body. In vocal prayer, more familiar to most of us, we recite fixed prayers such as the Our Father, the Hail Mary, Glory Be, and, happily, countless others, including many found on this website. 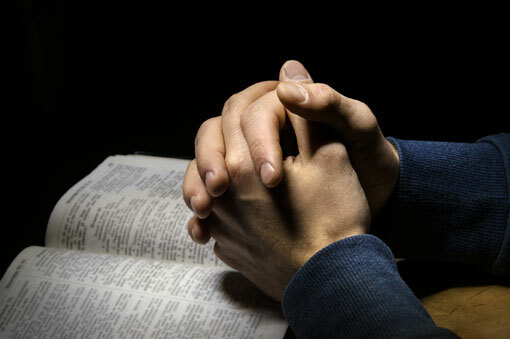 While vocal prayer is essential for sanctity, mental prayer is in some ways even more so, in that can “turbo charge” our relationship with our Creator, by diminishing our sinful proclivities and bringing us true peace of mind and happiness, as we draw closer to Him in a kind of loving detachment from worldly pressures and pleasures. Mental prayer differs from vocal prayer in that you are bringing your own thoughts and ideas before God about a particular passage of scripture or spiritual reading, or some other aspect of our Faith, in what St. Teresa of Avila once called a “heart-to-heart conversation” with God. Mental prayer is also referred to as meditation, but it is not to be confused with meditation that has Hindu or Buddhist resonances of reciting mantras (as in Transcendental Meditation) and breathing exercises. If mental prayer is new to you, don’t be dissuaded from trying it, thinking it’s too difficult or that you might not do it correctly. You don’t have to be a mystic or a religious to engage in it! Various articles and books on various methods of mental prayer can make it sound quite intimidating, but in essence it’s not all that complicated. We've sought to enhance our introduction to mental prayer here by providing additional information on the subject from St. Alphonsus Liguori, Fr. Bertrand Wilberforce, St. Francis de Sales, and Rt. Rev. Dom Vitalis Lahodey. The links on these pages are excerpts from their writings that discuss mental prayer in greater detail. We also have a page of suggested reading as well as one covering any difficulties you might have. While we urge you to read the pages on mental prayer linked above thoughtfully, please don’t feel that you have to follow each of the methods they suggest to the letter, or otherwise you’re doing something “wrong”! You’re not. The only wrong thing you can do in mental prayer is giving up on it if you feel too distracted or that you’re not “getting anything out of it”. Keep in mind, as well, that the methods in mental prayer described below are meant as suggestions, as "training wheels" are on a bicycle, with the important difference that you can use them as long as you find them helpful. There's no time limit! In practicing mental prayer, you can take anywhere from 15 minutes to half an hour (more or less, with 15 minutes being a good starting point). The more that you can do this, the better! If one session seems too dry or pointless (or even several sessions) don’t assume this will always be the rule. If you give up because of dryness or distractions (which all the saints experienced at one time or another) you might very well miss out on other opportunities to experience God's love and wisdom in ways you never imagined! St. Teresa of Calcutta once said, in essence, “God does not require that we be successful, only that we be faithful.” That’s what perseverance in one’s spiritual journey is all about. In mental prayer, we exercise our memory, our understanding, and our will, which have been called the “three powers of the soul”. Speaking of threes, there are three easy-to-remember parts of mental prayer: the preparation, the meditation itself, and the conclusion. For the preparation you can start by focusing on placing yourself in God’s presence to put you in a good frame of mind to receive His thoughts and promptings. If you find it helpful, start with some short vocal prayers. The acts of faith hope, and love are good, as is this short prayer called Suscipe. The act of contrition can help you approach Jesus with true humility and sorrow for your sins, an essential part of mental prayer. Or you can recite some other short prayers such as those here. Ask God for His insights as well. (The great saint Alphonsus Liguori wrote about all this in more detail with some short suggestions for opening prayers on this page.) Keep in mind however, that your “warm-up”, using one or more of these suggestions, should be brief. Then, for the meditation itself, reflect on a scripture passage, some good spiritual reading (with some important suggestions here) or some concept such as our Lord’s Passion. (That’s where memory and understanding come into play). Don’t feel these have to be complicated, or even lengthy! (Indeed St. Teresa of Avila once spent an hour in meditation just on the words “Our Father”, not the prayer itself, contemplating the various ways in which God is a Father to us!) We have some further comments on this below. This leads to the conclusion, some constructive resolution to do better on your part, even if it’s only for that day or for a day at a time. This resolution can be as simple as deciding not to snap at an ornery co-worker or your spouse in a difficult situation; or in foregoing some bad habit to increase in virtue. FR. JON BARTUNEK'S "FOUR C's"
1) In placing yourself in God’s presence, find some place quiet where you won’t be distracted. You can be kneeling or just sitting down, if the posture of kneeling causes you to focus on some knee pain. The important thing is to be respectful in your posture. 2) In choosing Scriptural reading for your focal point, you can choose any passage from the Bible you might think best. Meditating on the Gospel passages, such as those on our Lord’s Passion, are especially good choices! For Spiritual Reading it’s best to look for those books that have an imprimatur from the Church in that there is nothing in them that contradicts our faith and morals (Examples of these would be a book contesting Jesus’ divinity, or some New Agey pantheistic text.) Books by and on the saints are highly recommended. Note again that your selection for meditation doesn’t have to be lengthy. You can also use a crucifix as a focal point to reflect on Christ’s Passion and its significance for you. Or perhaps some aspect of Catholic doctrine. Or thoughts about our Blessed Mother. The possibilities are endless! And if you find that some subject matter or reading is good for more than one session, by all means continue using it if you feel it’s helping you. Is your sin too much pride? Ponder Jesus’ preference of the repentant Publican over the proud Pharisee (Luke 8:9-14). Lack of trust in God? Take comfort in His calming the waves and let Him calm your own stormy sea (Mark 4:35-41). Always comparing yourself to others? Consider the rebuke Christ had for His disciples when they were arguing over who was the greatest (Mark 9:33-37). Feeling lukewarm or lacking in faith? Ask God to work with you to make your soul more like the rich soil so that His seeds of grace may not be devoured by birds; withered as they bounce off hard rock; or choked by thorns in His well known parable of the sower (Matt 13:1-23). Looking for inspiration as to how to be a better Catholic? Consider Jesus' famous teaching on salt and light from the Sermon on the Mount (Matt 5:13-16). In all cases, share your thoughts with God as they come up. Ask Him again for His insights as to how to grow closer to Him in holiness. This is all part of your conversation with our Lord, after all! 4) “Sum up” your time spent with Jesus with a resolution of how to follow Him more closely in your life. The idea is to “give God permission” (in St. Teresa of Calcutta’s words) to work within you in some way so that you can share His love and goodness with others. Remember to follow your resolution as best you can and ask for God’s help with this. Empty promises won’t make you more Christ-like or help you advance in holiness as a Citizen-in training for heaven. Take it one day at a time if need be. Say “Today, I will do (or not do) such and such, or for the next few days, etc.” Keep your resolution challenging in that you’re trying to give up some sinful habit or inclination, but keep it doable as well. 5) Some words of thanks and love never hurt to sum up your “session” with your Creator, in your own words and/or with some short vocal prayers, or just the Our Father, Hail Mary, and Glory Be to strengthen your will to carry out your resolution. Also, as we mentioned ealier, don’t let times of distractions or dryness keep you from this valuable time with our Lord. The saints had such moments, so don’t think that you won’t! Practice and perseverance is the key in mental prayer, as mentioned earlier. The more you can do mental prayer, even if its just in those 15 minute sessions, the more you’ll get out of it. Meditation can help you get control of your sinful inclinations as you draw closer to God rather that having them control you! You might well still be tempted to engage in bad habits (gluttony, lust, jealousy, drinking, gambling, hatreds, etc), but the frequency and intensity of such temptations will diminish over time. And the more you engage in meditation the more naturally God’s insights will flow, and the less cumbersome the process will be. In addition, as Father Bartunek points out, don’t think your effort is a failure if you don’t come away from it “feeling” something. As he put it, your relationship with our Lord isn’t just about “feelings”, but rather about friendship and love. Feelings can change. Our love of Christ shouldn’t, in good times or bad. (After all, His love for us doesn’t change!) If you do experience some warm, fuzzy emotions from mental prayer, so much the better. Just don’t expect them, that’s the point! Along these lines it is important to note that Catholic meditation is Christ-centered, not self-centered. There’s no naval gazing going on here! You have to empty yourself of all egotistical thoughts, at least for this quiet time with God, and let Him be front and center of everything in your life. As St. Augustine once said “Thou must be emptied of that wherewith thou art full, that thou mayest be filled with that whereof thou art empty.” The more you engage in mental prayer, the more you can allow Him to “take charge,” not just in these moments, but all throughout your day as well! We hope the linked pages above can increase your love of mental prayer and its knowledge of its various techniques, but again, don’t feel it’s all about following some “checklist”. This information is meant to guide you not to dissuade you. The main aspect of mental prayer is that in the end you might be like the disciples on the road to Emmaus who said after they had the ultimate Catechism class from our Lord when they said “were our hearts not burning when he opened up the scriptures?" (Luke 24:32). We’d like to leave you with these fitting words on the relationship our Lord desires very much to have with us, all of us and each one of us, with you. Come, I say...let us discuss everything with perfect freedom. Be concerned about sinners. Offer yourself to make reparation. Promise Me that at least today you will not leave Me alone…then see if My Heart is not asking something of you to comfort It."